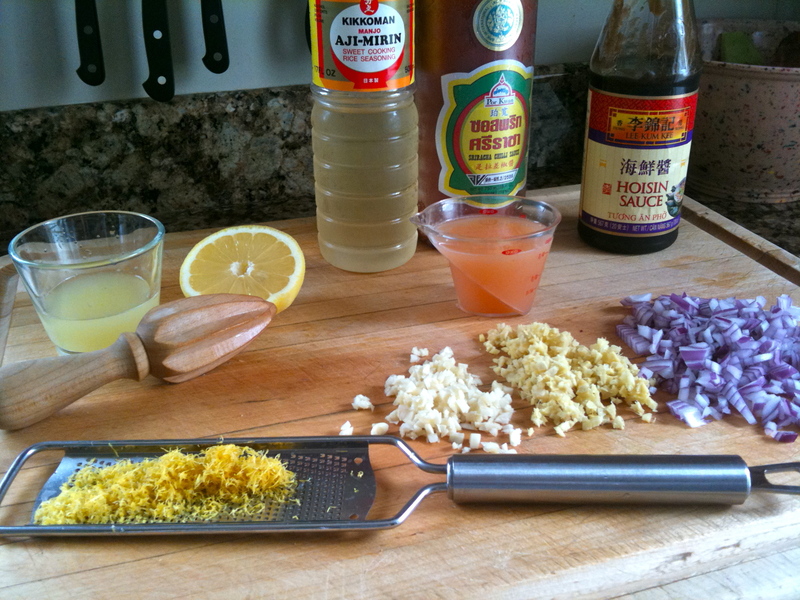 Big grilling weekend coming up soon, so I figured this would be a good time to share my super delicious Asian Citrus BBQ sauce. I’m not a big fan of the overly smokey BBQ sauces out there, so I set out to make my own with the flavors I love. 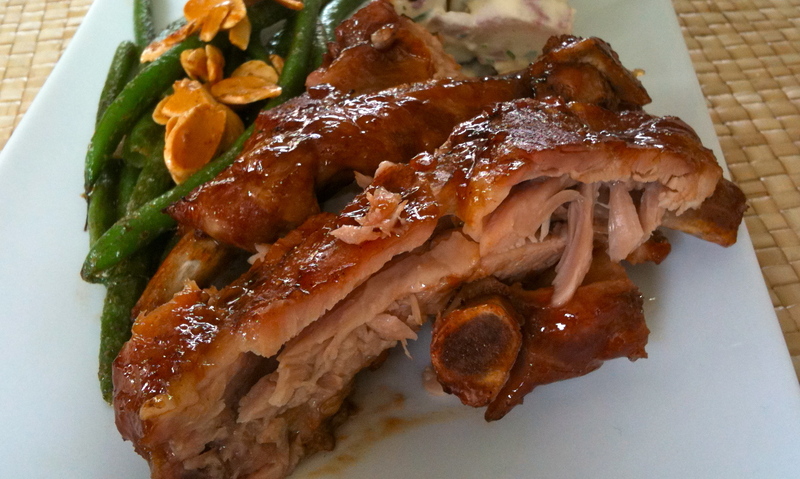 Baby Back Ribs are one of my ultimate favs. They are super easy to make and way too easy to eat. We take them camping pretty much every time we go, the kids LOVE them. 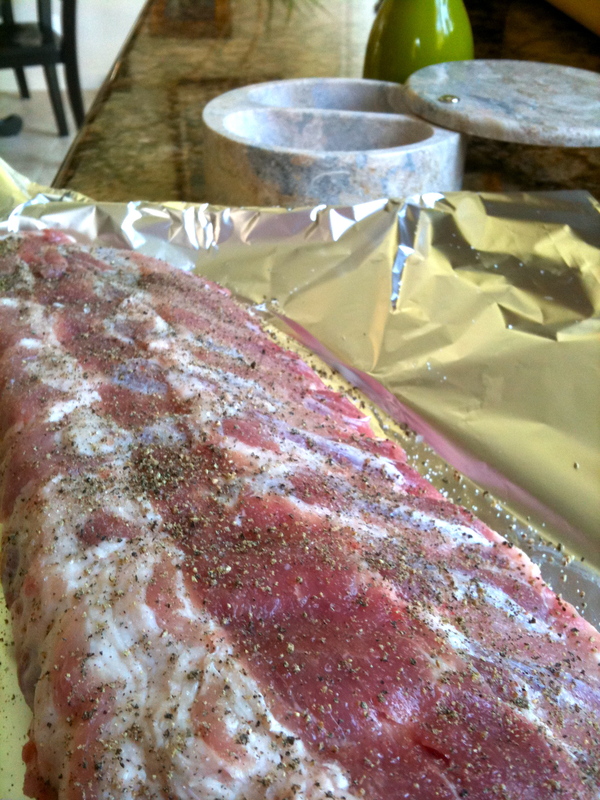 Ok let’s get started, preheat oven to 250 degrees, rinse the rack of ribs and pat dry. Salt and pepper really well on the meaty side. 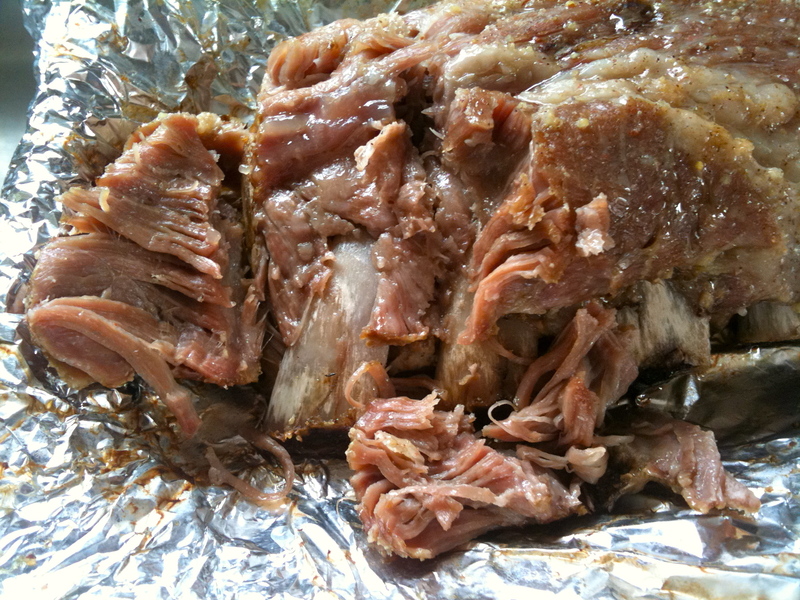 I use fresh ground white pepper, I think it enhances the sweet flavor of the pork. Wrap the rack in foil, place on a baking sheet and bake for 3 hours. Now for the sauce. Here is what you will need. In a sauce pot – heat up the canola oil add the minced red onion saute until soft – add the minced garlic and ginger – cook for a minute – and all remaining ingredients, except lemon juice– cook over low heat for 6-8 minutes – the sauce will be sticky and thick – remove from heat – add the lemon juice at the end and more Siracha if you want more spice. 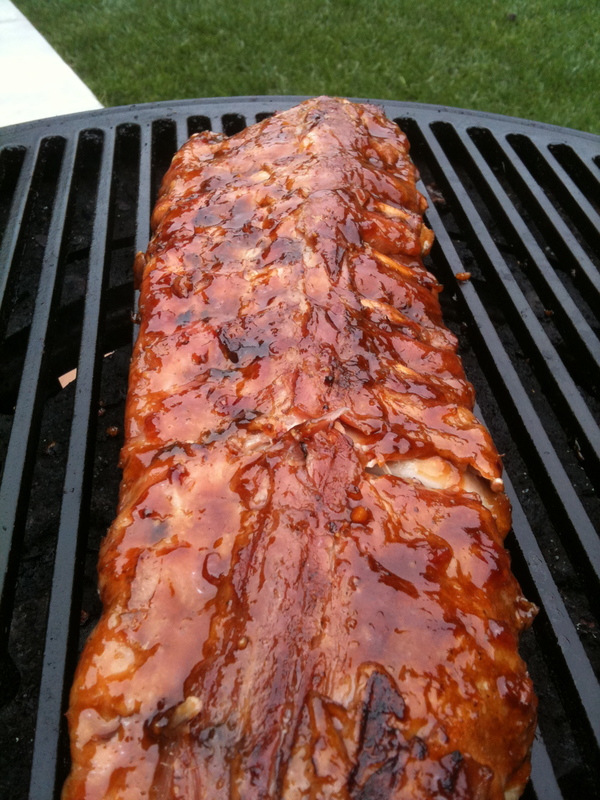 This will make about a cup of sauce, plenty for 1 rack and extra for dipping while you eat. The sauce should be thick and chunky and taste amazing! When the ribs are done, the meat will be falling off the bone. Slather them with the sauce and place them on a HOT grill, until the ribs are caramelized, should take 5 minutes each side. Serve them up hot with your favorite sides. I did a tri color potato salad and green beans sauteed in brown butter and sliced almonds. 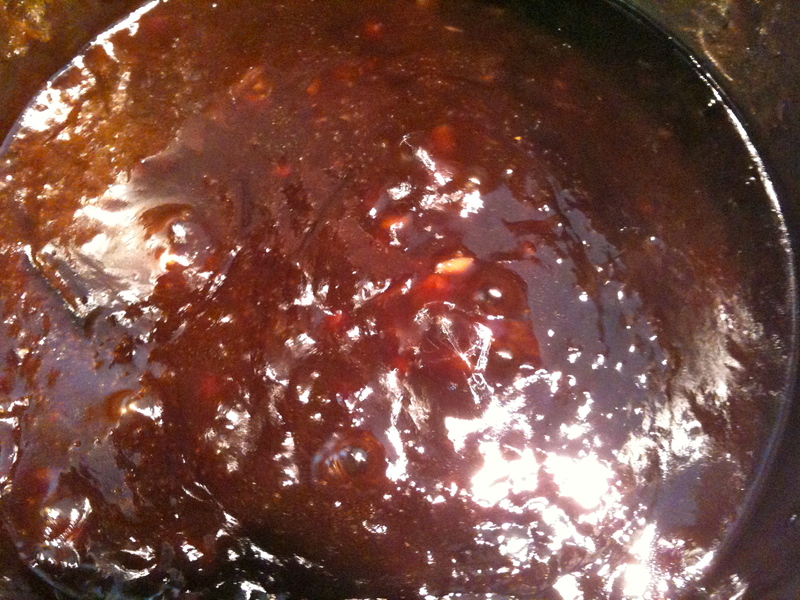 The sauce will work with chicken or seafood or you could bathe in it, it’s that good! 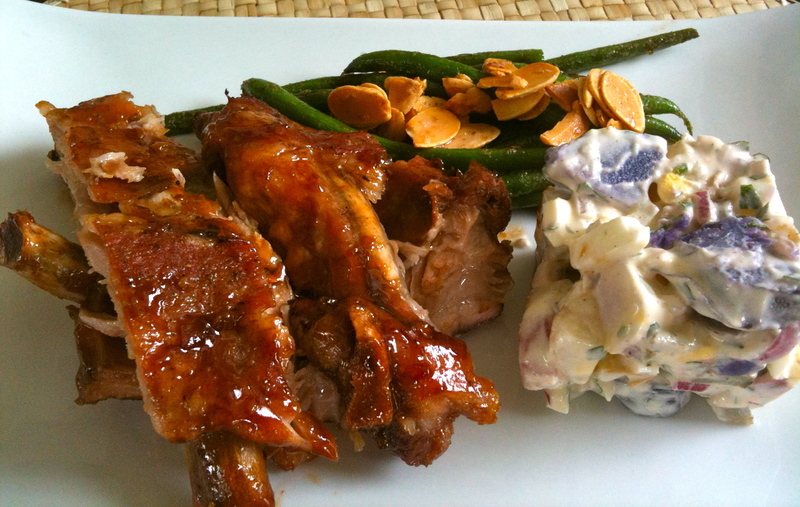 This entry was posted in Grilling and tagged asian, grilling, ribs by Sarah. Bookmark the permalink. Looks awesome Babe! I know what I’m having for dinner. And me, without an invite. Who took these amazing photos? Your recipes are amazing too! Royal Hawaiian eat your heart out! Oh My Godddd!!!!!!! I was just looking at some beautiful babyback ribs at Costco, but I didn’t buy them because I didn’t know how to cook them. I’m going back! I think even I can do this! Mmmmmm the drool is getting to be a bit much! So yummy! !